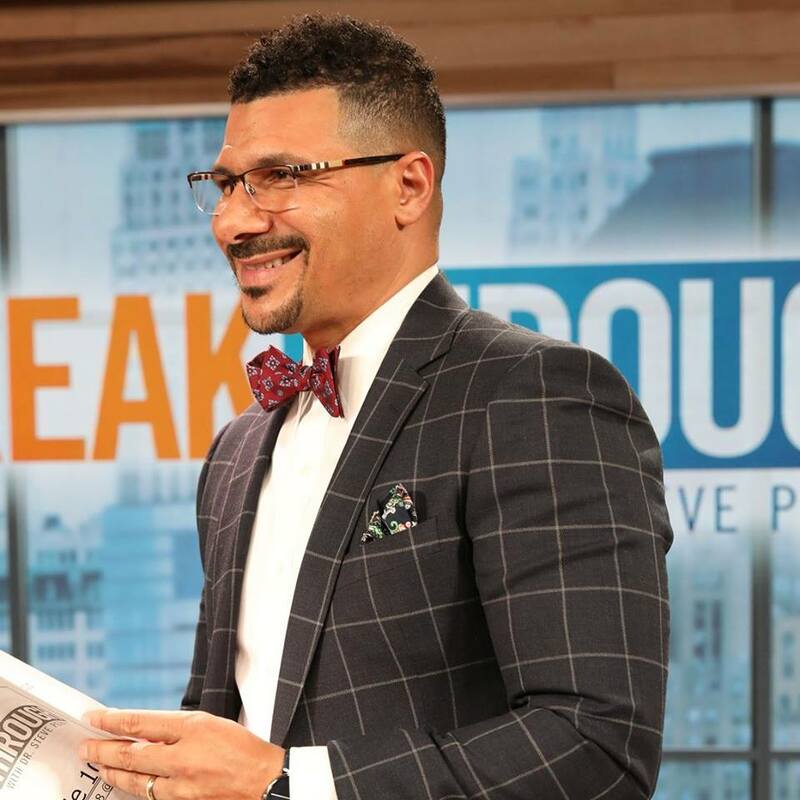 Dr. Steve Perry, MSW, hosts the try-out Fox show “Breakthrough with Dr. Steve Perry.” Photo from program’s Facebook page. Many TV tabloid talk shows tend to be exploitative. For instance, the host may focus on helping a woman discover whether her mate really is cheating on her and use a lie detector test to prove it. However social worker Dr. Steven Perry is trying to do something different on “Breakthrough with Dr. Steve Perry” by bringing social work expertise to daytime TV. So when a woman appeared on the show in January and said her husband was cheating Perry didn’t focus on getting the “gotcha moment.” Instead, he worked with the couple to see if the pain of infidelity could be used to help the couple decide whether their relationship was worth saving or if it was better to part ways. “When you watch what I do you will see something completely different,” said Perry, who earned his master’s degree in social work at University of Pennsylvania School of Social Policy and Practice. Want to ensure “Breakthrough with Dr. Steve Perry” stays on TV? Contact your local Fox affiliate to show your support for the show. Perry is already a nationally recognized public speaker and educator who opened magnet schools that specialize in helping children from economically disadvantaged neighborhoods forge a clear path to college and success. He is also no stranger to television — he was already host of the “Save My Son,”a TVONE reality show that featured parents who wanted to keep their African American sons from becoming another disheartening statistic. Perry said staff from CBS approached him while he was standing on the subway platform on 125th Street in Harlem with the idea of doing “Breakthrough with Dr. Steve Perry.” Fox taped 10 episodes of the program and will decide whether to continue the series based on audience reaction. Perry said he jumped at doing the program because it is important the public see the type of work that social workers can do in helping people improve relationships and overcoming life’s challenges. He also wants to improve how social workers are portrayed on television and encourage more men of color to enter the social work profession. Want to learn more about how social workers help improve our society? Visit the National Association of Social Workers’ “Help Starts Here” website. Great show, Dr. Steve Perry is definitely a speaker we should be watching daily because of his down to earth advice and genuine need to help! Curious about this new “social work” phenom, I squandered 15 minutes on google. In fairness, that’s not long. But other than the brief notation in the NASW piece, there’s not much to be found about this guy as a social worker. Clearly his PhD and professional identity has long been in Education, (and ok, it took some time, but I finally found a notation that his degree is an EdD and was conferred in 2008.) His own web site describes him as “a nationally recognized public speaker and educator.” (While avoiding any notion of credential or background.) And in some places (it’s a curious paradox: on both CNN & FOX news!) he is long reveled with the moniker of, “The Most Trusted Educator in America.” Until about 2 years ago. Then zipppppp. But it seem he’s now reinventing himself as a social worker. (MSW in 95) That’s cool. I suppose. But why now? I mean, what does it mean to be a social worker really? Spin? OK. I get that. Licensure? Perhaps. But no. That’s apparently not really necessary on TV. (He’s employed as an entertainer.) And social work is apparently his “fall back” profession. Final note: according to his bio published by the American Legislative Exchange Council (pronounced ALEX) he was the principal at the Capital Preparatory Magnet School in Hartford, Conn. ALEX makes a point that “Capital Prep has sent 100 percent of its predominantly low-income, minority, first generation high school graduates to four-year colleges every year since its first class graduated in 2006.” GREAT! But there’s no mention of his tweeted resignation from that school with one-days-notice in 2015. Or the other controversies around his pronouncements about public education and subsequent job search’s. What’s that about? I dunno. Maybe it’s just me. But ALEX? Seriously? Someone please, tell me I’m being silly? Anyone? When is the show aired –I just read about it today. I am sure that my social work colleagues here in Atlanta have not heard about this show; otherwise, someone would have mentioned it to me. More publicity needed. I have not heard of this show, nor Dr. Steve Perry prior to this NASW post. Unfortunately, or perhaps not, I don’t have time, nor do I choose to watch daytime TV anymore. I yearn for the days when television was filled with myriad soap operas. Those at least helped millions escape from the often harsh and mundane realities of their existence. Contrast this with today’s so-called “reality TV” which is false and exploitative. Reading about “Breakthrough with Dr. Perry” is a reminder of why my MSW professor cringed at the thought of the “Dr. Phil’s” of today. Instead of a well-known public speaker/educator with an MSW exposing a couple’s intimate and private relationship via television, perhaps Dr. Perry should refer these clients to Dr. Sue Johnson or Dr. Janina Fisher; two credible experts with a wealth of experience that I would bet can help that couple do the real work needed to heal following the trauma of infidelity. If “Breakthrough with Dr. Perry” is anyone’s idea of “bringing social work expertise to daytime television” their idea of social work expertise is in my opinion misguided, self-serving and not based in the realities of social work and the therapeutic relationship. Thanks so much for your comment. We appreciate it. However, perhaps you should reserve judgement until after you have actually watched a few episodes of the program. I am somewhat alarmed at how critical fellow social worker colleagues are about a person they have not heard of before or a show not yet seen. As social workers let us be supportive and if time permits watch the show and then criticize or praise as warranted. This is a profession that has gotten a bad wrap in the past so let us take a wait and see attitude as we wish this Dr. Perry well. Social Work matters and Spcial Workers can and do have positive impacts on chiloand familes. I am a proud Social Worker and I wish Dr. Perry much success.. surprised by some of the comments above. I’m proud that my social work education taught me to be an informed consumer and to be wary of trends, fads, buzzwords, and false messiahs. You’re disparaging colleagues who are being informed, judicious consumers who do their research before jumping on a bandwagon. These critical commenters have made some valid points. Yes, let’s reserve judgment and see how this show plays out, and let’s also not get too excited about something we haven’t seen. That coin flips both ways.